Roofing is a dangerous profession. Safety should be your number-one priority. NTEC Systems applied a high-solids silicone coating. 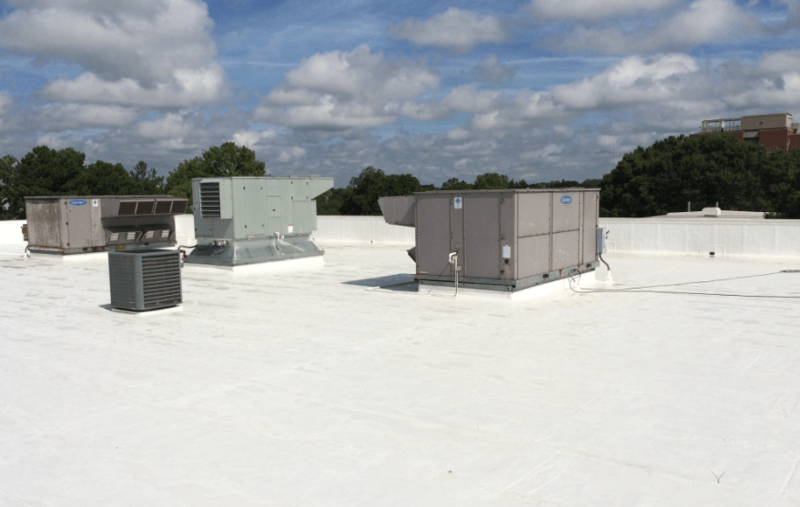 The system was chosen because it would extend the life of the existing roof and cut utility costs for the building. The system was approved for a 20-year warranty. Thomas Portaro is the owner of NTEC Systems, a company headquartered in Alpharetta, Ga., that specializes in roof restoration projects. Portaro owns the company, but on a recent project on the campus of Georgia Tech, it was definitely the college students who were in charge. Portaro was contacted by students who were researching different roof systems as part of a class project. 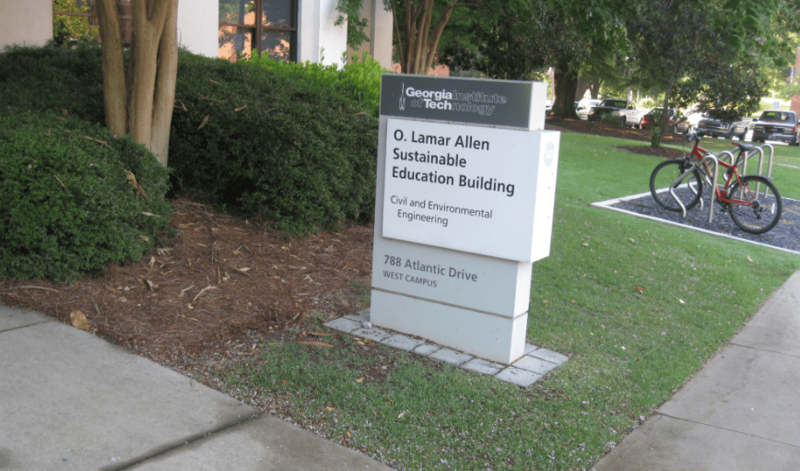 Members of the class had been tasked to come up with ways to reduce carbon dioxide emissions on the school’s Atlanta campus. Students were exploring all sorts of environmentally friendly building systems, including LED lighting and HVAC equipment. One group of students explored various building envelope modifications, eventually narrowing their focus to the roof system. “This particular group of students showed the school and their professors how they were going to reduce carbon emissions and the energy footprint of the O. Lamar Allen Sustainable Education Building by doing a roof restoration,” Portaro said. Portaro, a Georgia Tech graduate, was contacted by the group to provide some insights on the potential benefits of coatings. 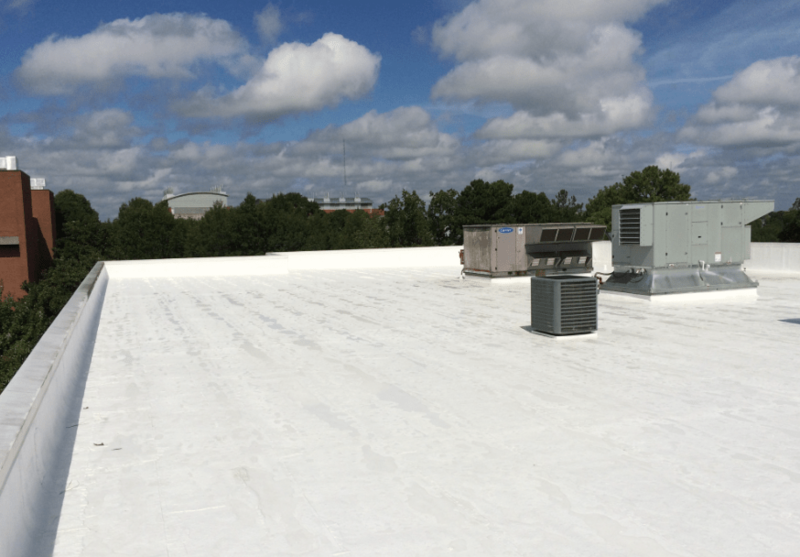 “I was asked to come down to the campus and give a brief lecture on the values of roof restorations, the types of coatings I was familiar with, how they were applied, and how they could restore this particular roof. The building was built in 1998, and its roof was the original modified bitumen system. When students learned how a cool roof system would extend the life of the roof and save on utility costs for the building, they not only presented their findings to their professors but officials at the university. The school ultimately decided to fund the project. 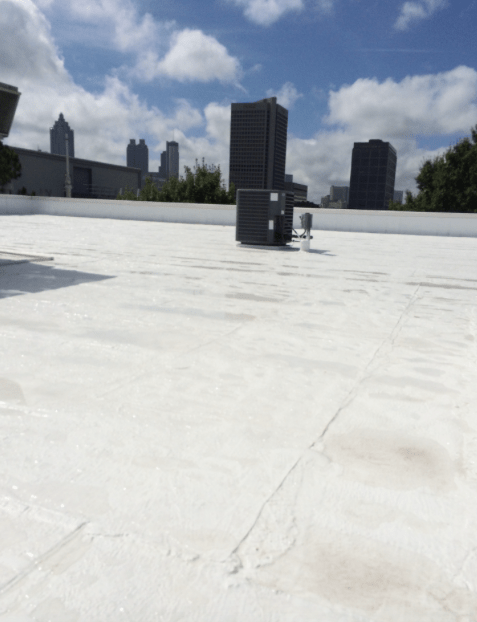 Georgia Tech funded a roof restoration for the O. Lamar Allen Sustainable Education Building after a student project detailed the energy-saving benefits of a cool roof coating. Infrared analysis was conducted to ensure the roof system was dry. Some minor repairs were needed, but overall the modified roof was in good shape. It was cleaned with pressure washer and primed with an asphalt bleed-blocker from GE Performance Coatings. NTEC crews then spray-applied two coats of GE Enduris 3502 high-solids silicone roof coating to a minimum thickness of 40 mils when dry. The system forms a monolithic coating that is self-flashing. “We detailed it all out, the inspectors inspected it, and at the end of the day it was all done, the 20-year warranty was in place, and everyone was happy,” Portaro says. Portaro has installed a lot of cool roofs, but the Georgia Tech project was special. “This was certainly the coolest project I’ve ever done,” he says. Make sure you have a clean, organized work area. Block it off from children and pets. Identify and avoid all site danger areas, such as dangerous power lines, unsafe roof access areas, and underground hazards (such as cesspools and power lines).